The last of the Anglican cathedrals to be built entirely from scratch on a new site and in the 20th century. 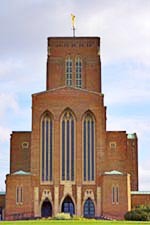 The Guildford diocese was created in 1927, however the designated Parish Church Cathedral soon proved too small for the growing congregation and plans for a new cathedral were laid. With Britain in the midst of the 1930's economic depression the fund raising project was boosted by the donation of six acres of land atop Stag Hill. The hill a former Royal hunting ground has commanding views and was given by the 5th Earl of Onslow. An architectural competition was held during 1932 and won by Sir Edward Maufe. 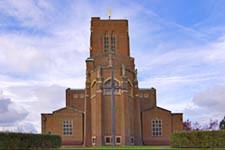 Maufe, later engaged by the War Graves Commission, had already designed several parish churches and was designing St John's at Hook at the time he won the competition. Many of these structures for example All Saints Church Weston Green show similar design features and brick construction predating the Cathedral, as do their interior. The foundation stone was laid in 1936 with work on the east end proceeding immediately only to be interupted by the war and resumed in 1952. The foundation stone was placed on ancient stones brought from Canterbury and Winchester Cathedrals ensuring connection with the medieval monastic origins of the faith. On resumption of building costs had quadrupled. However yet another donation of land boosted efforts. This time Richard Bedford, ex-Prime Minister of Canada, bought and gave the 20 acres of land surrounding Stag Hill as a mark of the War ties between the two countries. The chancel was opened in 1954 followed by the nave in 1964. Fund raising borrowed an idea used to raise St John's - the sale of bricks. The Cathedral bricks sometimes called Half-Crown Bricks were fashioned from the clay of Stag Hill itself and those purchased and signed by the Queen and Duke of Edinburgh can still be seen. The Cathedral was consecrated in 1961. It has the last carpet handmade by the original weaving company at Wilton and 1,460 kneelers of individual design. The Garden of Remembrance outside the Lady Chapel was dedicated in 1997 under the teak cross made from the timbers of HMS Ganges. Constructed of red brick and standing on Stag Hill the Cathedral is visible for many miles around.The tower is 160 feet high, and contains twelve bells, cast by the Whitechapel Bell Foundry which created the original Liberty Bell, and Big Ben. Above the tower is a 15 foot gilded angel, which turns in the wind. Inside, the cathedral is filled with light reflected from white Italianate marble floors and pale Somerset sandstone. The Omen, a horror film with Gregory Peck, was filmed at the Cathedral adding the golden wind-vane on top of the cathedral east end for filming and which has been retained.